Béla Fleck is on tour again and this time I hope not to miss him. His latest project is “Throw Down Your Heart: Tales From the Acoustic Planet, Vol. 3 – Africa Sessions” which is both music and a documentary film. Fans of Béla Fleck and West African music will not be disappointed. The documentary follows Béla through Africa as he searches our the African roots of the banjo. (You did know that the Banjo originated from Africa, right?) Béla traveled to Tanzania, Uganda, the Gambia and Mali while recording his latest album with local influences. The documentary also covers Africa today from the eyes of of someone other than the doom and gloom of main-stream media. We get a look at Africa that is very different than the way it is portrayed in today’s media. Much like Neal Peart’s portrayal of the rich culture of Africa and the warms hearts of its people, the documentary opens the eyes of the viewer to the beauty of the continent that arguably holds the future to peace on planet Earth. 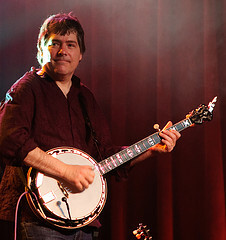 Béla Fleck and The African Project will be performing at The State Theatre in Fall Church, VA on April 9, 2009. Tickets are $50 in advance. See the State Theatre website for details.